We are finally going to a stand-alone ECU in our Project Evo IX with Link Engine Managment! Since the beginning, our car has been tuned with ECU flash, an open sourced tuning solution for the OEM ECU. However, we had run into the limitations of the stock ECU. One, ECU flash being open sourced does not have all of the ECU’s controls adjustable. We were having issues with idle control and going into closed loop correctly with larger injectors. We also wanted to get rid of the odd and problematic, especially in a car with a big cam, Mitsubishi-centric Karman Mass Airflow Meter. We also wanted to be able to run flex fuel and this was not possible with the stock ECU in its current development. ECU flash is not like a Cobb Access port where the Cobb team continually updates and improves the interface. It is basically free, community-based shareware. 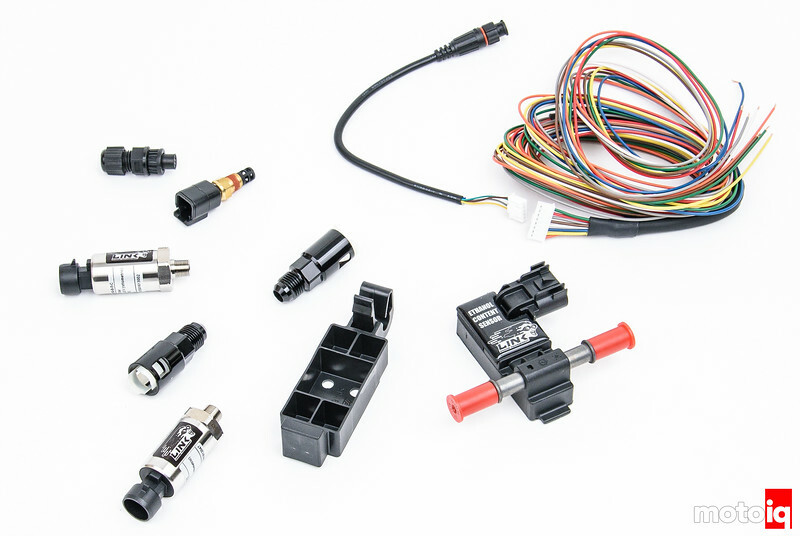 We wanted more control of our car’s engine but we also wanted to keep the reliable OEM connectors and wire harness and the clean and reliable OEM mounting of everything. Fortunately for us, Link Engine Managment makes a developed plug and play ECU for our Evo IX that installs right into the OEM ECU housing! We selected Links Evolink IX PLug and Play ECU for our next major upgrade. The Evolink is basically Link’s G4 Extreme ECU but with the circuit board modified to fit in the OEM ECU case and the factory connectors to plug directly into the OEM wire harness for an easy and clean as a whistle install. Using the Link ECU is now going to give us full control of our engine with its many features. This is going to be very important because we want to run flex fuel and to integrate our AEM water injection into the mix. We are particularly interested in these of the many features the ECU offers. Up to six fuel and ignition maps: This will be useful because we want to have several operating modes. E85, Pump Gas, variable blends of the two and water injection for enhancing performance with pump gasoline and for track use thermal control on E85 and high boost. Precision closed loop cam control: So we can take advantage of the Evo IX’s intake variable cam timing to improve low end and mid-range torque and to use to limit cylinder pressure to reduce knock on 91 octane fuel mode. OEM Idle hardware supported: Poor idle control with our Cosworth M2 cams has always been an issue with ECU flash. We will get our car to have a more stable idle with our new Link! 3 switchable boost control tables: This is going to be very handy with our flex-fuel plus water injection scheme. Antilag, launch control and no lift to shift are all available: Launch control and no lift to shift were great additions to our STI and we want to do it on the Evo to aid it’s sometimes-balky shifting. We want to do a mild version of anti-lag on our car as well. On board 4 bar MAP sensor: We are going to speed density to get rid of the weird Karman Mass Airflow Sensor. Having a built-in MAP sensor is a great addition to our system and saves us the trouble of mounting and configuring an external one. Knock control with windowing: Knock control is very useful but sometimes the ECU can mistake other mechanical noises like multi-disc clutch rattle, exhaust system ringing and even injector noise for knocking and take action on them upon detection mistakenly. By windowing, the user can define the knock sensors operating area where the ECU will look for knock and correct it, this way a lot of false knock correction actions can be avoided. The OEM Evo ECU is infamous for being sensitive to false knock and the Link’s windowing feature should help avoid this. 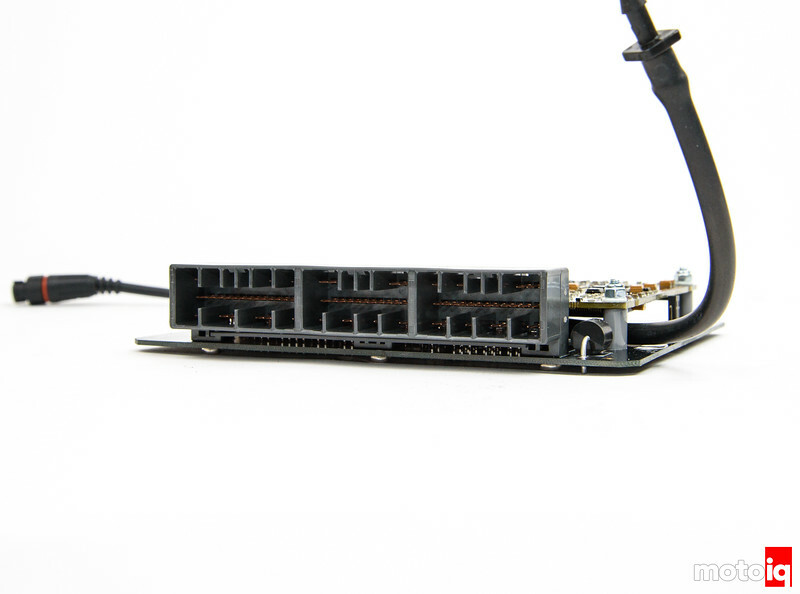 The Link Evolink ECU has tons more neat features that you can read about here but these listed above are the ones we are the most interested in for our project. To use all of the features that we wanted to use for our new link system we got some additional parts with our Evolink. To be able to use some additional sensors for flex fuel and controls for our water injection we got the XS Expansion loom so we could wire these into our ECU. Of course, we got an ethanol content sensor for flex-fuel use. A fluid pressure sensor for closed-loop control of our water injection system and an intake air temperature sensor. The Evolink ECU has an OEM connector so the stock wiring harness plugs right in. This avoids having to come up with a new wiring harness or butchering up the reliable OEM harness with potentially unreliable splices. 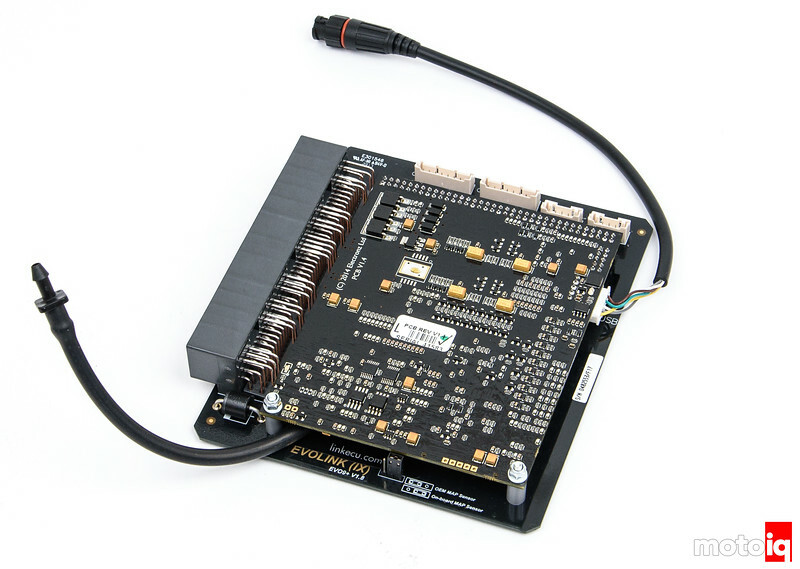 The Evolink ECU itself is a ruggedized circuit board that fits inside the OEM ECU case. The board features surface mount components and coatings to protect them. Every Link ECU is subjected to a 9-hour burn in QC test. Typically an ECU or any electronic component that is going to fail will do so in the first few hours of operation and a burn-in test will catch these units before they can get into the customer’s hands. Burn-in tests are usually reserved for high end and critical electronic components like aerospace use parts. What does this offer over an AEM EMS? MotoIQ used to review AEM pretty hard and be used in many builds. Just curious, what this is offering that you couldn’t get with your tried and true system? The features of the two are similar but what I like is the super clean plug and play install using the OEM case and connector without needing an adaptor harness. OEM connector? Yes please! Yeah that alone is a huge feature, making it more reliable. Sure doesn’t make manufacturing easy for them, and adds cost to the unit due to low volumes. What’s cool is that Link makes true plug and play applications for a really wide range of cars. I used to have a 2002 WRX with a LINK ecu circa 2005’ish? Tuned by Bill at Quirt Performance at the time. It was fun, geeky, not a good daily driver mod, and hated non-resistor spark plugs. When the weather turned humid, the car ran down on power/sluggish. After about 6 months, went back to a piggyback system, later an opensource tune. There have been a few generations of Link ECU’s since then. I have some problems with open source tuning hence I am going to a stand-alone. The biggest thing is the AEM EMS is well known for “Igntion Drift” issues. This in simple terms means your timing is NOT following your Ignition Angle from your calibration at high RPMS. I have personally seen AEM to be as far off as 100%. 6 degrees in the Cal netting 12 degress at the crank with a timing light @ 9000 RPM. The AEM was IGN sync’d before you go saying it a set-up error and it matched IGN angle at idle . As the RPM increases the drifting is increased. Having to replace the factory trigger wheel is not needed on the Link Ecu when your processor can hang with the one the car comes with. Why not go with the Cobb Accessport? Cobb does not support the car. Since everybody and their mother is using open source Tephramod to tune their Evo’s I gotta ask, who are you using in SoCal to tune using the Link system? It sounds really good and am on the verge of going E85 on my IX so I may switch to Link now. Thanks for the insight! Probably Church Automotive Testing. Link’s modeled fueling equation for flex fuel is supposed to make it super easy to get good results. Full flexfuel / phantom knock resistance / speed density / good driveability on large injectors can all be had on stock 8/9 ECU. Contact TSComptuned for fitronic controller then he can tune or so can Boosted Tuning and English racing. I looked at that, I just don’t like remote tuning solutions myself. The evo ecuflash and evoscan combo is prolly the most developed flash platform out there, paid or free. The reason Cobb doesn’t support the platform is because the open source support is so good, it’s actually better than what Cobb or Ecutek offers for most if not all of their platforms. Cobb used to have the AP for evo but nobody was buying them cause open source is better. And I’m pretty sure all the reasons listed for getting a standalone can be done via open flash. Except of course better knock control and I’m sure Link does flex fuel better. That being said, I’m in no way saying going to a Link ecu is a bad idea or a waste of money. A good stand alone has its advantages. If I ever get an evo again, Chances are pretty good I’d prolly get a stand alone too. Let’s just not pretend that the open flash support for the evo is weak or even that no Cobb support is any sort of disadvantage. There is NO comparison from a “true” standalone to any reflash PCM solution. At best a reflash solution mimics 30% of the potential of a standalone and its flexibility. The more flexible the software/hardware equates to better control and resolution. The better the control the better the tune. Additional modifying OEM calibrations well, the EPA is not so keen on that . no argument that a quality stand alone will work better than a reflash (although idk about 30% specifically), and I thought I made that clear in the second paragraph. And I’m not sure what you’re getting at with the EPA comment, they’re not keen about aftermarket stand alone ecu’s either… its pretty much the same in their book in that you’re changing the oem tune. I was just pointing out that the evo open source options nearly aren’t as limited presented in this article. I also understand not wanting to do remote tunes… lucky for me English is close enough to be considered local. My personal evo was pretty mild, but I’ve driven a few evo flash tuned by Aaron at English on big cams and turbo’s and making over 500whp and idled fine on speed density. I mean it didn’t idle like it was bone stock, but its not going to with any ecu when it revs to 9k. I didn’t drive it enough to really comment on low speed drivability, but I didn’t have any issues despite the on/off switch clutch. Hahaha, come here and get my car to idle well then! I definitely agree that the article is a bit misleading. There are tuners that provide just about all the options above with stock ECU. Maybe they gave the ECU out for this article review so that would make a lot of sense or maybe because a lot of the stuff mentioned is still not as well known such as the flexfuel on stock ECU. Then remote tuning may not be optimal but I personally believe it is more optimal for more people than to change an ECU out. Unless of course you plan on going standalone anyway. Although if you do your own tuning then this option would be amazing since the flex tuning has only been released to a select few, Even though word is the XML has been leaked here and there. Misleading? Have you personally used ECUflash on one of these cars with big cams? I have, on this car. Changing the target idle speed, the idle control percentages, the timing at idle all seemed not to do anything with the version I had. I think some of this might have to do with the weird way the Mitsubishi MAF works with the vibrating reed, changing the flow characteristics drastically at idle with the cams overlap could be messing it up. Speed density would probably fix this but I really don’t like remote tuning and I don’t have the time to learn how to retune with it right now. Lastly, this is how I want to set up my car, I want the flexibility of a stand-alone, how am I misleading anyone. Basically this whole excerpt is false. There are tuners that are very capable of making your car idle great on HUGE injectors and large cams and there is true flexfuel on stock ECU. Currently my vehicle is 100% flexfuel. I can run E10 (lowest ethanol content CA fuel goes to) to E80 (highest I’ve found at the pump) with ZERO issues or hiccups. So the Flexfuel state is completely false, the other statement is misleading because there are tuners that can make your car run so the wording of “We were having issues” is true but still misleading. Not trying to be a internet hard @$$ or fight or make piss you off but people don’t need this ECU with a capable tuner and I think the community should know that. How about this then, I don’t have time to learn the new stuff that has come out since I last used ECUflash and none of our local tuners that I trust can do flex fuel with the stock ECU and I don’t want to do a remote tune. thats a much more accurate representation. Although I’m surprised that Church or RRE (both have been featured on here, so I assumed you trust them as tuners) couldn’t get this sorted on a stock ecu. I mean I don’t know specifically that they can, but they’ve both been in the game long enough that I thought they’d have it figured out. I have Cobb for my GT-R and STI and its highly developed and works really well. ECUflash doesn’t have full control over all the parameters and where it supposedly does, I think the maths wrong or something because nothing happens when you change the values or it doesn’t work very well. I could never get the IX to idle right with the cams and the low-speed driveability was somewhat poor. Its been several years since I paid attention to this car so perhaps it has improved but it had drawbacks when I was actively working on the car. I replied to both you and Tooner in the one post above. OEM Evo 9 ECU has full flex fuel ability via FiTronic. I guess you guys did not know that? I have been using FiTronic ROM and control unit for about 6 years, and they are about to release new ROM that does not require any haredware. In addition as far as big injectors and idle: this is just a matter of latency settings. There are literally 100s of Evos if not 1000s of Evos with 2150cc injectors idling smoothly. Finally, Speed Density (SD) conversion -which is just a $100 worth of MAP sensor and little wire-harness provided in the kit – is very common upgrade for cars with wild cams and big turbos that would potentially benefit from larger than 3.5″ intake. WIth SD conversion, OEM air-flow-meter is eliminated. But if you ever speak to experienced Evo tuners, most will suggest to keep OEM Air Flow Meter because when you know how to manage it, it is actually a really wonderful device that enables perfect part-throttle response. The reasons you enumerated are not based in fact: seems that you never even spoke to local experienced tuner like RoadRace Engineering? And I expect more from you, to be more informed than average owner and tuner, since you are an authority.